Ongama Mtimka provides cutting-edge political commentary in South Africa with a specialist focus on the link between politics and the economy. He has been a programme director and keynote speaker at various government and public sector events. His fifteen years working experience position him well to speak authoritatively on the impact of political trends on various aspects of South African political and economic life. Ongama appears regularly on the top two 24-hour national TV news channels, eNCA and the SABC and has had various interviews with Sky News in the United Kingdom, ABC News in Australia, and TVC News in Nigeria. 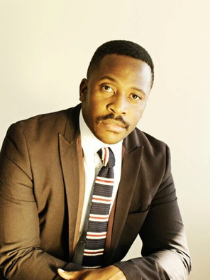 He features weekly at the country’s second biggest radio station Umhlobo Wenene FM and on influential radio stations in the country including Talk 702, Power FM, SAFM, and Kaya FM. He holds a Bachelor of Arts from Rhodes University and Masters in South African Politics and Political Economy from Nelson Mandela University where he lectures in the fields of international relations, South African politics, and security, peace, and reconstruction. He has attended and presented at International conferences in Brazil and the United States of America, represented the Eastern Cape at the International Trade Centre in Geneva, Switzerland. He was recognized as a Top 40 under 40 in Nelson Mandela Bay by the city’s business chamber. His research includes an analysis of the economic impact of the Coega special economic zone, the political economy of transformation in the construction sector, and political unionism in South Africa. Ongama has worked as a spokesperson at Coega and the Nelson Mandela Bay Municipality, External Relations Manager at Ubuntu Pathways, and leading consultant at his company Lawula Group.